3) <<The scattered disc is a distant region of the Solar System that is sparsely populated by icy minor planets. The scattered-disc objects (SDOs) have orbital eccentricities ranging as high as 0.8, inclinations as high as 40°, and perihelia greater than 30 astronomical units. Their orbits can extend well beyond 100 AU. Re: So long & Tonks for the fishion! <<One of the most iconic photographs in spaceflight history is that of Earth, seen from a distance of 4 billion miles by the outward bound Voyager 1 spacecraft. The 1990 “Pale Blue Dot” gave the world a profound realization that everybody — from all human history that has ever existed — lived on that one tiny speck in the distance, as legendary science communicator Carl Sagan remarked at the time. Now, 23 years later, a photograph of another “pale blue dot” has been released by NASA — the faint signal from Voyager 1′s radio transmitter reaching us from interstellar space after traveling 11.5 billion miles from Earth. Last week, NASA confirmed that Voyager 1 had officially left the solar system’s heliosphere, escaping from the heliopause and entered interstellar space, the first man made object to leave the sun’s domain. Therefore, this pale blue radio speck is the first man made radio signal ever to be received from interstellar space. 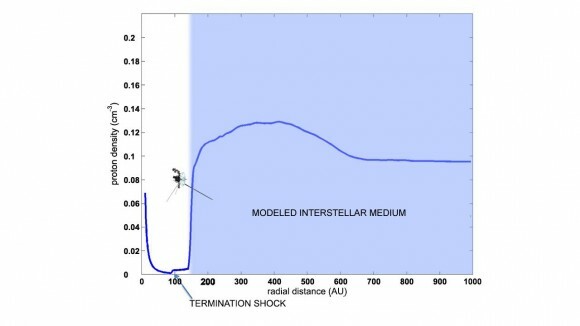 According to NASA, the signal being generated by Voyager 1 is very weak. The spacecraft’s main radio transmitter generates just 22 watts — the approximate radiated power of a refrigerator light bulb. But to a huge radio array like the VLBA, Voyager 1′s signal is easily detectable as a faint radio glimmer in the darkness of the interstellar ocean. Quick, answer the phone. It's us calling. All the Voyager calls are 'collect' calls, to give us the information they've 'collected'. Out of interest, how big is this blue spec in real terms, compared to the earth. obviously its a radio wave travelling towards earth, i imaging that the waves get bigger and the blue spec larger the further away voyager gets? so if this beam were to hit earth would it take up a small amount of earths surface or a large part due to the distance travelled? theres a reason im asking! by the very high resolution Very Long Baseline Array (VLBA). The expanding Voyager radio wave that you are contemplating (not pictured ) involves the much lower resolution (by 4 orders of magnitude ) of Voyager's High Gain Antenna, itself, or ~ 1º (= about a 2 AU wide radio beam by the time the signal reaches Earth). what if similar signals were being beamed to us from faaaaaaaaaaar away. would the beam not be so wide as to be undetectable? what if similar signals were being beamed to us from faaaaaaaaaaar away. would the beam not be so wide as to be undetectable? Yes...which is one reason that NASA is experimenting with laser communication. <<In outer space, the communication range of free-space optical communication is currently of the order of several thousand kilometers, but has the potential to bridge interplanetary distances of millions of kilometers, using optical telescopes as beam expanders. In January 2013, NASA used lasers to beam an image of the Mona Lisa to the Lunar Reconnaissance Orbiter roughly 240,000 miles away. To compensate for atmospheric interference, error correction code algorithm similar to that used in CDs was implemented. The distance records for optical communications involved detection and emission of laser light by space probes. A two-way distance record for communication was set by the Mercury laser altimeter instrument aboard the MESSENGER spacecraft. This infrared diode neodymium laser, designed as a laser altimeter for a Mercury orbit mission, was able to communicate across a distance of 15 million miles (24 million km), as the craft neared Earth on a fly-by in May, 2005. The previous record had been set with a one-way detection of laser light from Earth, by the Galileo probe, as two ground-based lasers were seen from 6 million km by the out-bound probe, in 1992. It would amuse me if aliens with no concept of war and therefore no concept of peace discovered the Voyager disc or any kind of message such as "we come in peace"
They wouldn't understand the word without an explanation of what war is first. I think I'd avoid the humans after such an explanation. I think you're exaggerating. In the world where animals kill and eat each other (or other living beings such as plants) 24/7, it is highly illogical to expect any advanced species to have no concept of war. Okay, aliens could be unlike our animals and more like plants. But then, just sitting there doing nothing and getting energy from their star is not great source of evolutionary pressure towrds intelligence. It did not work for our plants. They never became sentient. And they had way more time than apes. I'm not exaggerating, just speculating. I don't know how any technological civilization could evolve without the concept of war or conflict but I don't think it's too hard to also speculate the possibility. You have to detach yourself from Earth evolution, though. To the point, the key mechanism - selection - means killing off losers. Which entails competition in order for it to happen naturally. Unless there is God who breeds intelligent aliens on purpose. Second, run it 20% slower so i can read most of it. Third, BIG DEAL A computer simulation of something that clock parts cannot do. Fourth, maybe I'm a bit grumpy because it's midnight. makc wrote: Earth evolution is nothing special. Maybe it is, maybe it isn't. It's our only example. A sample size of one isn't much to go on. Weird things happen with your research if your sample is too restricted. so I read you article and see nothing weird? basically only arseholes would "sacrifice money to punish someone who had the good luck of getting to play the other role in the game" so I actually think USA results are weird. but maybe you guys are just too rich for 50 bucks to matter, and would judge better given few more zeroes. makc, if you read the article, you'd know that's exactly what it was saying: USA results are weird - the weirdest of the weird, in fact. But I will go out on a limb and say that I bet even 50 bucks matters to many of us here. And very interesting article, geckzilla. Thanks for sharing. Oh I was under impression that the article said those non-american people he tested were weird.